Stainless steel cutlery has good corrosion resistance. Stainless steel knives and knives need to be polished during production, so they have good polishing performance and are not easy to scratch. Stainless steel has good high temperature resistance, so stainless steel cutlery (or cutlery) can be autoclaved. 304 stainless steel has the characteristics of high temperature resistance, good processing performance and strong toughness, so it is often used to make stainless steel cutlery such as cutlery. 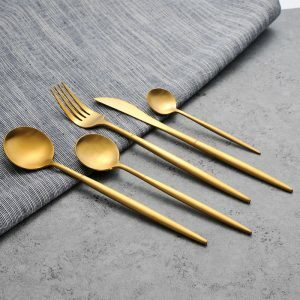 430 stainless steel has good oxidation resistance, corrosion resistance and welding performance, and is safe and non-toxic, so it is often used to make tableware. PP: Pure texture, non-toxic and tasteless, good strength, stiffness, hardness and heat resistance. The molding process is good and the shape is varied. 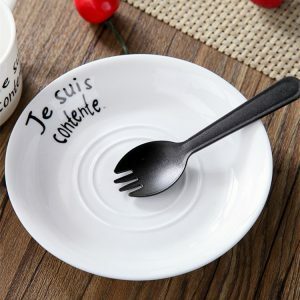 Common organic solvents such as acids and bases have little effect on it, and can be used to make tableware (such as cutlery, plates, etc.). PE: It is tasteless, non-toxic, water resistant, low temperature resistant, heat resistant and has good chemical stability. It is resistant to corrosion of acid, alkali and salt aqueous solutions at normal temperature, but is not resistant to strong oxidizing agents such as fuming sulfuric acid, concentrated nitric acid and chromic acid. 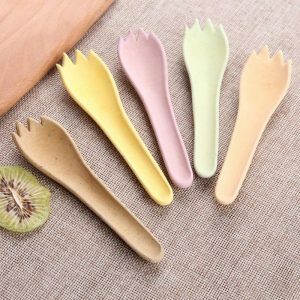 Because it is safe, non-toxic and has good processing properties, it is often used to make cutlery and other tableware. It is mainly made from whole grains, such as wheat, corn, purple potato, etc. It is environmentally friendly and delicious. Pure natural texture, with a natural atmosphere, more retro. 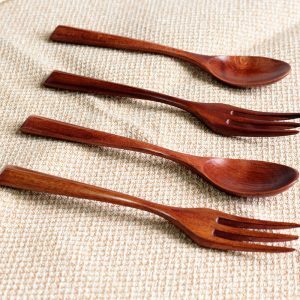 Every wooden cutlery is unique , in addition to being used as a tableware, it also has the collection function of art.